LOS ANGELES , March 20, 2019 (Industry Intelligence Inc.) – Starbucks has long ruled the coffee realm, but now its reign is being challenged on multiple fronts and by companies you might not expect. 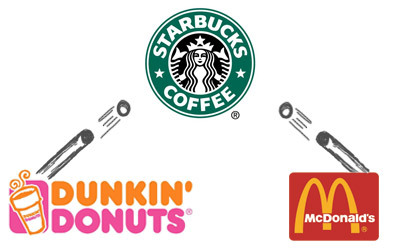 For years, it was easy to figure that Starbucks’ main competition was chains with a similar business model. Places like Coffee Bean or Peet’s Coffee immediately come to mind. But recently, competition began sprouting up from unlikely sources. First there was McDonald’s, the gold standard of fast-food chains, which began targeting Starbucks drinkers with its McCafe line of coffee beverages at a lower price. Then Coca-Cola dove head first into the coffee industry with its US$4.9 billion acquisition of UK-based Costa Coffee, which has more than 3,400 coffee shops across 31 countries. But it’s Burger King’s recent move that is truly pure genius. The fast-food chain most famous for its Whopper burger sandwich created a Netflix-like subscription model allowing customers to receive one small coffee a day for a $5 monthly fee. We live in an age of low-cost monthly subscriptions that give people access to large amounts of content. The beauty of this system is that it’s cheap enough that people will pay for it even if they never use it. I, for one, have subscribed to Hulu for a year and a half and have watched exactly one show. Why do people do this? Because it’s cheap enough that you don’t even think about. You subscribe, enter your credit card info and forget about it. Rinse. Lather. Repeat. Burger King’s subscription coffee service could potentially capture the exact same thing: A slew of customers who will buy a subscription because it’s so cheap and will keep the service even if they hardly or never use it. And here’s the real beauty part: If Starbucks tries a similar model, the company puts itself at risk because its price point is much higher among its latest unlikely competitors. So the company opens itself up to customers taking a closer look at its prices and wondering whether the extra cost is worth it. The coffee war is attacking Starbucks on all fronts. And there may be more attackers to follow.